We all want a faster computer, don’t we? That shiny new laptop or desktop you bought might be zippy at first, but over time will get slower, if you don’t maintain it properly. Junk files and such keep accumulating in the background with every installation or update, and before you know it, gigabytes of space gets occupied. Often, it’s just Windows being extra cautious and keeping backups, but there’s also a lot of times where the files left behind are just completely unnecessary. Whatever the case, they should be removed. Apart from that, there’s startup programs and programs that run in the background without you knowing. Again, a lot of them are absolutely unnecessary, and take up precious processing power you could use for more important tasks. See where we’re going with this? Computers can get extremely slow because of small things accumulating, and we haven’t even started on registry cleanups and minor optimizations! Now, you’ll probably find a lot of ads and popups telling you to download software to speed up your PC, and in most cases, they’re all useless adware. There’s only a few good programs out there that cleanup your laptop or desktop, and even fewer that are free. The useless ones usually ask you to pay for cleanup after checking, and exaggerate problems, or install toolbars and adware silently, so it’s very important to get the right tool. We tell you 5 great free tools to speed up your laptop or desktop PC that actually work! First up we have the extremely effective and no-nonsense CCleaner. Developed by Piriform, CCleaner is one of those rare tools that does exactly what it advertises, without any drama. You won’t find a flashy UI and fancy animations, but it does its job effectively. Included is a temporary and junk file cleaner, a registry cleaner, system restore tool, drive wiper, uninstaller and startup manager. The temporary and junk files as well as the registry cleaner are pretty much just ‘analyze and clean’, but the startup manager is manual. 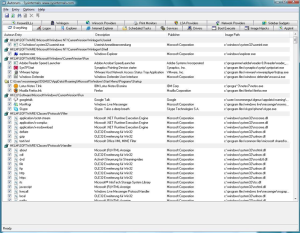 CCleaner just displays a list of the programs starting up with Windows, and it’s up to you to remove them. Discretion is advised, since it does not advise you on what to remove and what to keep. 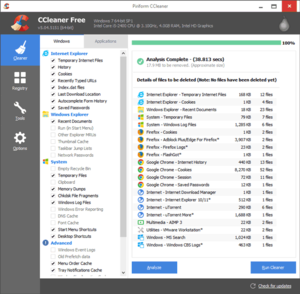 We think CCleaner is one of the best tools available, free, light and completely safe. A must have! The hard disk drives we use commonly in laptop and desktop PC’s are magnetic, and actually have something called a ‘platter’, where the data is stored. Several platters are used to increase storage capacity, but that doesn’t change the fact that the data is physically accessed by the spindle. Basically, data is written to a section of the platter, and if you want to access it, the spindle has to physically be at that section. Now, if the data is fragmented, and spread out all over the disk instead of being at one place, data access naturally becomes slow, because the spindle has to check multiple sections. Defragmentation is a process in which all the data is organized better, so that access is faster. Plus, free space is consolidated. 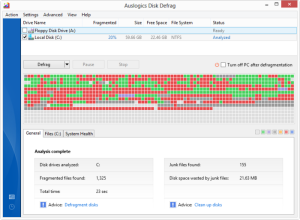 Although Windows has a built in disk defragmenter, it’s not particularly great, so we recommend AusLogics Disk Defrag Free. This light and quick tool defragments your hard disk, optimizes file placement and keeps the MFT separate to reduce chances of corruption. It’s easy to use as well, so shouldn’t be troublesome for new users either. Fragmentation is usually one of the biggest causes of slowdown, so make sure you defragment your laptop or desktop PC regularly! If you’re the sort of person who doesn’t want to bother much with clicking around and checking what to do, SlimCleaner is for you. It’s a pretty great tool that optimizes and cleans your laptop or desktop PC without much intervention. Using data aggregated from its users, it recommends optimal settings for your computer. It’s got a junk file cleaner, startup manager, disk cleaner, registry cleaner, settings optimizer, file shredder, scheduled optimizer and much more. 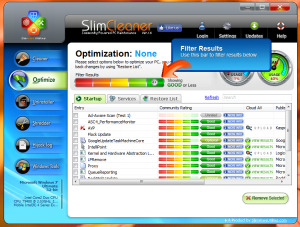 SlimCleaner is a fantastic piece of software that does almost everything, one of the few viable all-in-one tools out there. Highly recommended from our side! If you’ve got a new laptop, chances are that it’s come with software you don’t need or use. Known as bloatware, these programs are basically useless web applications, trials for expensive paid software or just unnecessary utilities. It might get difficult to understand what tools should and shouldn’t be kept, so if you’re unsure about what to do, Should I Remove It? is the tool for you. This lighweight application basically tells you, via user aggregation, about which programs you should let be, and which ones you should remove. Most of these unwanted programs startup with Windows or run in the background and slow down your computer, so getting rid of them is always a great idea. 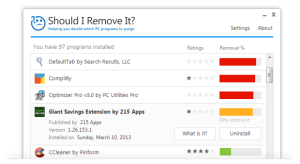 The ratings and percentage of removal tell you which programs are harmful, and which aren’t. Finally, we have Autoruns, a super detailed tool that lets you manage, you guessed it, autorun programs. It’s the most comprehensive startup monitor tool you can find, but we have to say, it’s not for newer users. There’s no handholding or automatic scanning here, Autoruns aggregates all information about startup programs and sorts them into convenient categories for easier review. It won’t tell you about which ones are good and which ones aren’t, but what it does do is tell you which ones are from Windows. Apart from that, it also scans for BHOs (Browser Helper Objects), boot hijack images, Windows services, media codecs and more. One of the best tools to understand what’s going on under the hood. You’d be surprised about how much stuff is running in the background! We guarantee, if you keep using these tools as recommended and regularly clean up your laptop or desktop PC, you won’t ever face problems of slowdowns. Do let us know if you had any problems, or need help using them!